The name of the game for selling luxury real estate has changed worldwide. Gone are the days when you can publish a set of high-end photos on the MLS along with a full-page spread in the paper and actually get a luxury listing sold quickly. The trick to being successful as a luxury real estate specialist is not about selling real estate; it’s about selling luxury as a lifestyle. So how do you sell luxury lifestyles? With content! Lots, and lots of content. Not just one type either. In order to sell an over-the-top listing, you’re going to need to create a variety of content like articles, short films, and virtual reality experiences that ignite a sense of provocative intrigue and excitement about your listing. The goal here, is to help potential buyers imagine themselves indulging in a life of splendor, opulence, and dissipation, as a result of buying your listing. You do this by creating a lifestyle story and using both modern and classic platforms to distribute that story. One way to tell a story that will get your luxury listings the attention they deserve, is to hire models to portray a “day in the life” story-line in a short film centered around the property. Use all of the classic elements of a great story including conflict and climax to keep the viewers engaged till the end, where your call to action lies waiting for them. Throughout the film, your models and story will be showcasing the biggest and best wow-factors the property has to offer. In the end, find a way to make the house come out like the hero. Once you have created content to intrigue and engage your target buyers, you have to distribute it properly to ensure that it gains the right types and amount of exposure. With proper planning and strategy, this can actually be done for little to no cost. The following are the three most important platforms you should use to distribute your content. The first (and most obvious) home for all of your luxury listing content, is your website and any landing pages you have created for the listing. 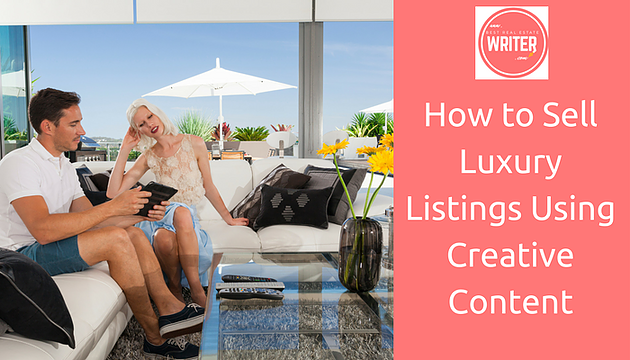 Make sure that any and all luxury listing content you have, is appropriately positioned on the page in order to capture the attention it deserves. Also be sure that your websites have been optimized for search engines using SEO practices like keywords and meta descriptions. One of the most powerful ways to get major traction with luxury listing content, is to use and abuse your social media platforms for all they are worth. If you are a luxury real estate specialist, you should already belong to a series of groups, pages, and channels on Facebook, LinkedIn, etc., where affluent real estate wheelers and dealers spend their time. Take advantage of those memberships by posting your gripping and eye-catching content in those forums. Of course, don’t forget about the power of Facebook ads and the ability you have to pin-point their placement in front of your target buyers. You have an email list for a reason. Create a stunning email campaign that showcases the story or stories you have built around your listing and captivate your contacts. Remember that the email itself is just the bait to grab their attention. You always want to lead them back to your luxury listing’s website or landing page to funnel your leads even further. Make sure that your call(s) to action are clear, visible, and non-threatening in order to increase your conversion rates. Rather than using an abrasive clickable button that says something like “Call For A Private Showing” try something softer like “Start Your Story at [address]” or “Sink Into Splendor at [address]”. One of the most fabulous benefits that you will enjoy from using content marketing to sell your luxury listings is the perception you will create of yourself as an agent. Even if buyers and sellers are not interested in that particular listing, I promise you they will be completely blown away by the content you have created and the marketing prowess and creativity you have showcased with these techniques. Each time that you invest in creating quality content for your luxury listings, you are going to see stunning returns on your investment in the way of web traffic, social media engagement, professional respect from peers and clients, and of course, closings. Need help creating a captivating SEO-friendly story that sells your listings? Hire me to write one for you.